During the past year I researched creating a cinema site for the San Francisco Bay Area, offering film reviews, feature articles, interviews and complete movie listings that would include the very special one-night screenings, filmmaker appearances and other unique cinematic events that are not usually found at online “showtime” sites. Those I asked loved the idea, but it soon became clear that it would be an intensive and expensive proposition, competing with many other sites offering some of these things. While at Landmark Theatres one of our marketing innovations was the very first movie-related website with articles by and about filmmakers and showtime listings. I had created some modest food related film series at Landmark and since leaving that organization developed a more adventurous concept. And in the back of my mind I kept thinking about combining these two ideas. And one day while waiting for a 9am doctor’s appointment——you know, the ones that start 45 minutes late——it came to me: “EatDrinkFilms,” an online magazine with quality writing about each of these categories, sometimes possibly even crossing over with a filmmaker writing about food or libations and a chef or mixologist offering thoughts about movies. After a few months of exploring the possibilities and asking if the “EatDrinkFilms Festival” would find a receptive audience, it was time to move forward. This publication came first and we are planning an actual event that will fill big screens and your various sensory palates in 2015. I had an editor in mind but he was not available for an April start. One of our most talented local film writers, whose site The Evening Class has been a favorite place to find in-depth interviews with filmmakers, Michael Guillen was meeting with me at the San Francisco International Film Festival to discuss some articles he might create for us. Though I had posted the first two issues it was clear that an editor was essential and Michael offered to step in through the summer, especially while I would be busy preparing for the Telluride Film Festival. His multiple talents and interests not to mention a terrific ability to focus on the organization needed to make this a weekly reality was our good luck. In four months he has established EatDrinkFilms.com as a place both writers and readers seem to enjoy. But Michael’s tenure has ended and he wants to get back to his other projects. And Johnny Ray Huston is now available and started last week as our new editor. We will continue the eat and drink columnists you have enjoyed along with the Critics’ Corner offering two points of view of selected new movies. Plus plenty of special stories we think you will enjoy. Huston was the Bay Guardian’s Art Editor for 14 years, gathering a diverse selection of stories and events for that newspaper’s devoted readers. in addition to being our Editor he also has long been Editor of the magazine Inside Tennis (In fact as I write this he is in New York covering the U.S. Open). And he also happens to be a fine writer with interests including film, art, music and food. Johnny is currently exhibiting as part of the [ 2nd floor projects ] at the Yerba Buena Center for the Arts where you can read about his many other art, film, music and writing projects. Our Associate Editor, Tien-Tien L. Jong has been with us from the start, having designed and launched the site. She makes sure everything is in place, looks good and is easy for you to enjoy. Tien-Tien has also contributed several fine articles about the movies. Now that another successful Telluride Film Festival has ended I will spend more time working on ways to make this site pay for itself so we can continue to pay our writers and editors. 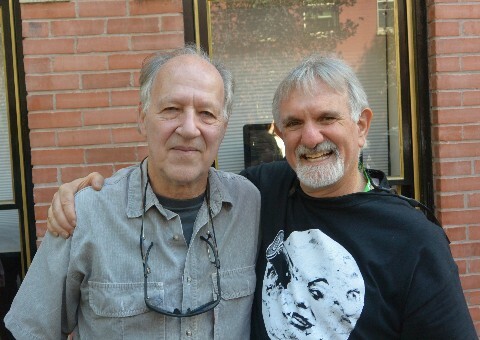 Werner Herzog and Gary Meyer, at this year’s Telluride Film Festival. Photo by Leonard Maltin. We hope that you enjoy EatDrinkFilms and let us know your thoughts and suggestions on our Facebook page.